The new star of Cadbury's Easter Bunny commercial won't be a bunny at all. But that's totally fine with us because his wrinkles are almost too cute for words. Meet Henri, an English bulldog from North Carolina who just happens to look adorable with an extra set of ears. The competition was fierce this year for the chocolate brand's first "Bunny Tryouts" contest — an opportunity for pets across the country to earn their own set of rabbit ears and star in a new commercial. Cadbury's iconic clucking bunny commercial hasn't changed much over the last 35 years, so for 2019 the maker of those delightful creme eggs decided to switch things up. Watch Henri get ready for his big debut! https://bit.ly/2V22YFA Check out what happened behind the scenes during the making of the CADBURY Clucking Bunny TV commercial with our 2019 winner, Henri. This year, according to a press release, Cadbury opened its heart (and Instagram account) to all the animals in the land to see who would be cute enough to join the famously loud rabbit. The pets could be any animal — horses, plenty of dogs, cats, a lizard and even a horned dragon were all submitted. The only stipulation was that they had to be photographed with bunny ears on their heads. Among the 4,000 entries and 19 semifinalists, one lucky dog was selected. Maybe it was the delicate fuzziness of his ears (both pairs), or perhaps it was the oversized bowtie that captured the judges' hearts. Henri's undeniably pudgy physique, disgruntled expression and wrinkly skin no doubt played a part. And soon he will get the chance to shine alongside the real Cadbury bunny in a commercial debuting in April. 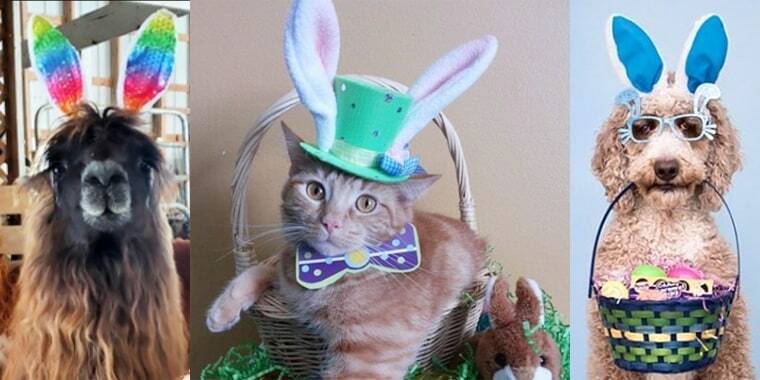 Of course, Henri isn't the only furry friend that's so adorable people might just say, "Easter Bunny, who?" Even geckos can hack it. This little Maltese named Coco might even make folks look twice. Nacho the cat is a pretty chill-looking rabbit. While all of these animals certainly fit the cute bunny bill, Henri took home the prize because, well, just look at him!